The author being pulled from 44-degree water during the filming of Cold Water Boot Camp. I was in the freezing water for 30 minutes, on purpose. 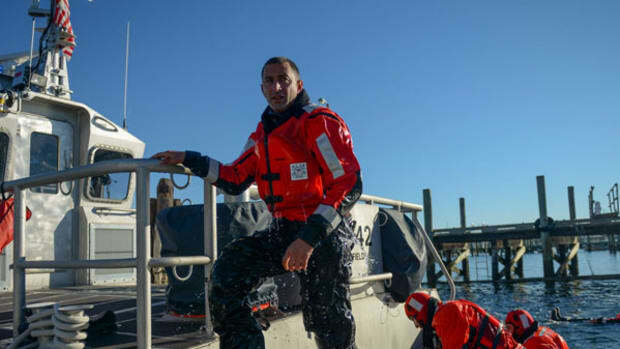 On a grant from the U.S. Coast Guard, the National Water Safety Congress was filming Cold Water Boot Camp, an educational video designed to clear up misconceptions many boaters have about hypothermia. My job that morning was to swim until I drowned — or at least started to drown. 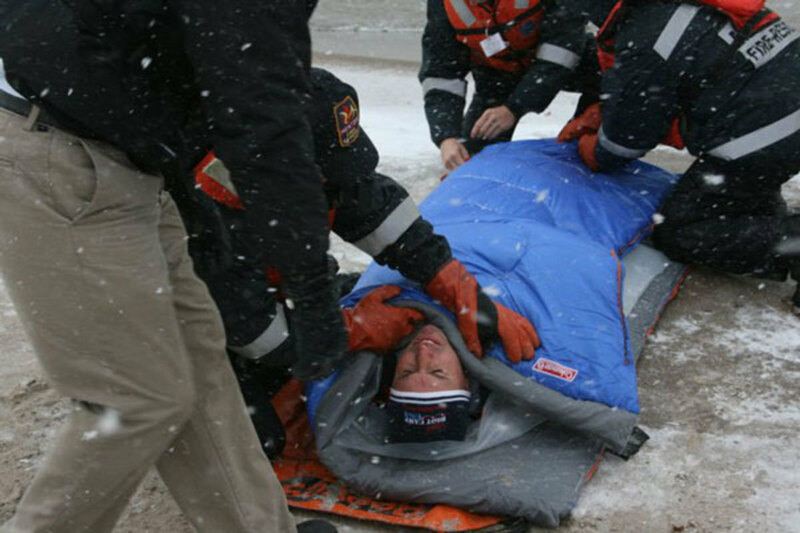 It turned out that boaters aren&apos;t the only ones with misconceptions about hypothermia. Two years later, I was back in Lake Erie for the production of Beyond (Cold Water) Boot Camp, a one-hour training video for professional rescuers and instructors. The intended audience was first responders and medics, but there are lessons in there for all of us. 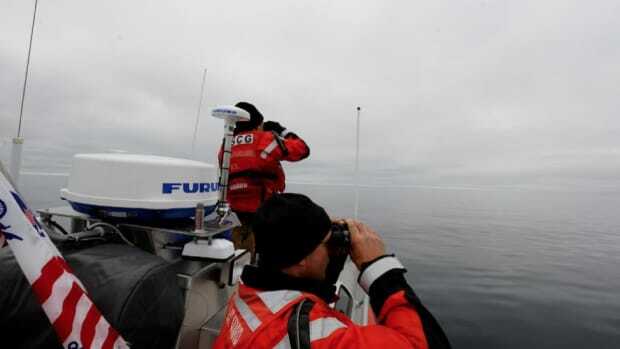 Being recovered from Lake Erie – December 2010. When a person spends an extended period in cold water, they have changed physiologically. Their bodies contain both warm and cold blood; their heart’s ability to speed up when it needs to has decreased; and cardiovascular and nervous systems are temporarily altered in such a way that may lead to significant heart malfunction. Here are some best practices for recovering those who have spent time in cold water. The Heat Escape Lessening Position can help your body to reduce heat loss while immersed in cold water. ● Recover them as horizontally as possible. If you can avoid lifting them out of the water vertically, do it. But if you must lift them out vertically, get the person lying down immediately once on board. The hydrostatic pressure from the water on their body has made it easier to maintain blood pressure. As soon as they are removed, the heart has to work harder — and a cold heart doesn’t do well at working harder. ● Don’t make them work for it. 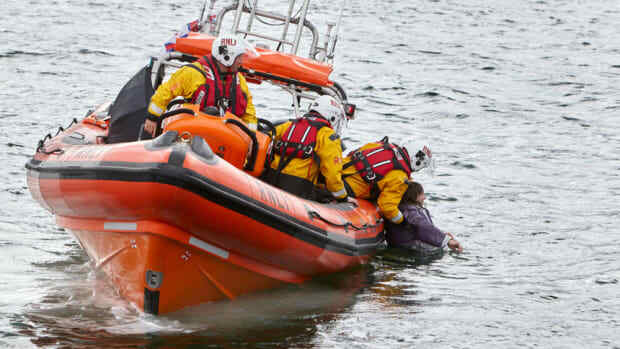 Don’t ask them to pull or to exert themselves during their rescue, if it can be avoided. Remember, they are in a fragile cardiovascular state and climbing after being in the freezing water may be the last thing they ever do. ● Remember, none of this is as important as getting them out of the water. If you’re at sea, and the only way to get them aboard is by hauling them over the rail like a big tuna, then haul away. Just do it carefully and be gentle with them once they’re aboard. No pounding through the waves in a race back to the dock, either. 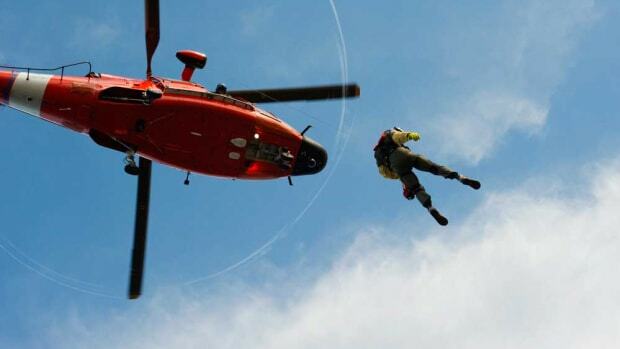 Just because you got the rescued person out of the elements doesn’t mean they aren’t still cooling off. Wet clothes will continue to cool the person and hinder recovery. Getting them dry sounds easy enough, but this is another area where there is a right way and a wrong way to do it. ● All modesty and dignity can be reserved for another day. Once you have them inside the cabin, absolutely every stitch of wet clothing comes off. It is better to cut clothing off (safely — medical bandage scissors are best) rather than have them endure the flexing and stretching of the limbs that occur when pulling off clothing the regular way. You want them laying down and moving as little as possible. ● Use towels to gently pat the water from their skin and hair and NEVER rub the person dry. Trying to rewarm a victim by vigorously rubbing their skin actually has the opposite effect. It makes them colder. A cold-water victim’s skin contains the coldest blood in their bodies. By rubbing it, you essentially push it back into play before the body is ready for it. ● Thickness equals warmth. 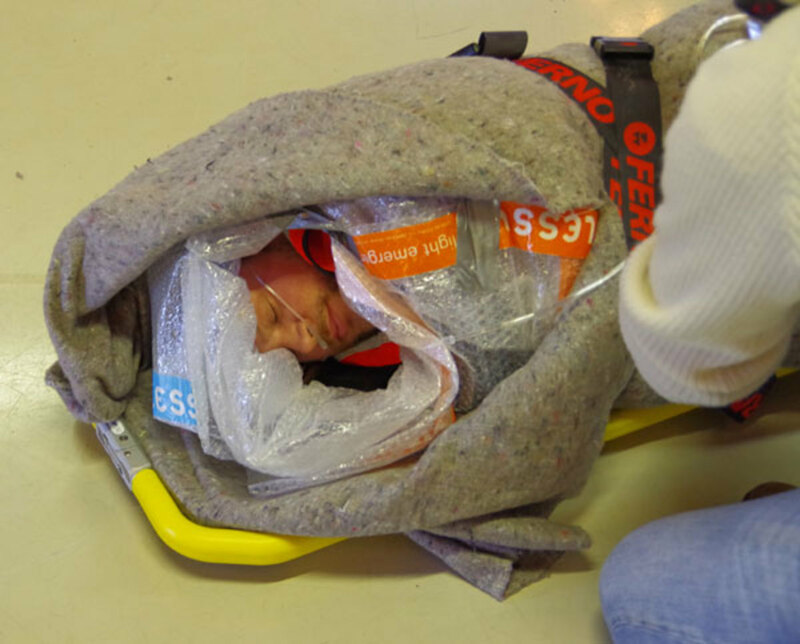 Wrapping the victim in layers (and more layers) of loose-fitting blankets and keeping them inside in a warm, dry place are the first goals after removal from the water. Everything you have done so far has been about preventing further heat loss. If they are dry and covered up out of the elements, that prevents more heat loss. Symptoms of hypothermia can include cold skin, lethargy, confusion, slow reflexes, seizures, slow breathing and slow heartbeat. Now that they are dry and out of the elements, their recovery can begin. If they are intensely shivering, that’s good. But for those who have never seen it before, this sight is a little disconcerting. It looks awful, and feels even worse, but it is just the body trying to regulate temperature. I can tell you from experience that the first 10 minutes out of the water is far more painful than any 10 minutes in it. But if they are lying down, dry and shivering, things are looking very good. What you want to do next is help them... wait for it... keep shivering. If your recovered victim has been in the water long enough to shiver violently, then they’ve burned an awful lot of calories. Depending on when they last ate, they may be running low on available fuel and need a boost. Knowing that, what do you think is better for your freezing and shivering crew member: a warm cup of water or an icy cold soda? Pick the soda. A warm sugary cocoa is better, but the point is that calories are more important than the temperature of the drink. The victim needs the calories to fuel the shivering until they are fully recovered. People recovering from cold-water immersion often look miserable. Their skin may be so red that they look as if they have a bad sunburn. Sometimes they shake violently. Many sound as if they are in pain — and they are. But if you have done everything discussed above and the person is red, shivering and complaining about how miserable they are, they are probably just fine. 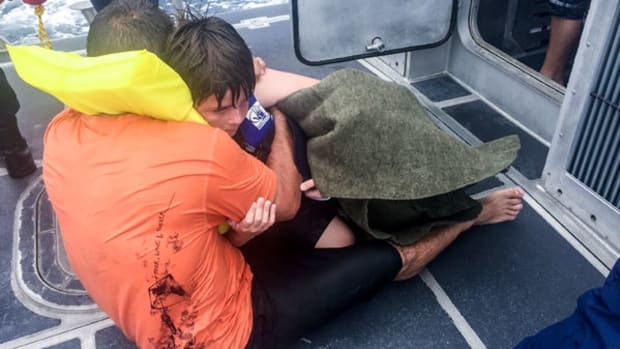 By now you should have already called the Coast Guard and be slowly heading towards medical care, if necessary. There are a ton of variables in handling victims of cold water immersion, and those who read this far will likely have more questions. You can’t learn everything you need to know in a blog post. If you want to know everything you can about caring for a person with hypothermia, set aside an hour and watch Beyond (Cold Water) Boot Camp. C’mon, watch it. My friends and I froze ourselves silly to help make that thing. 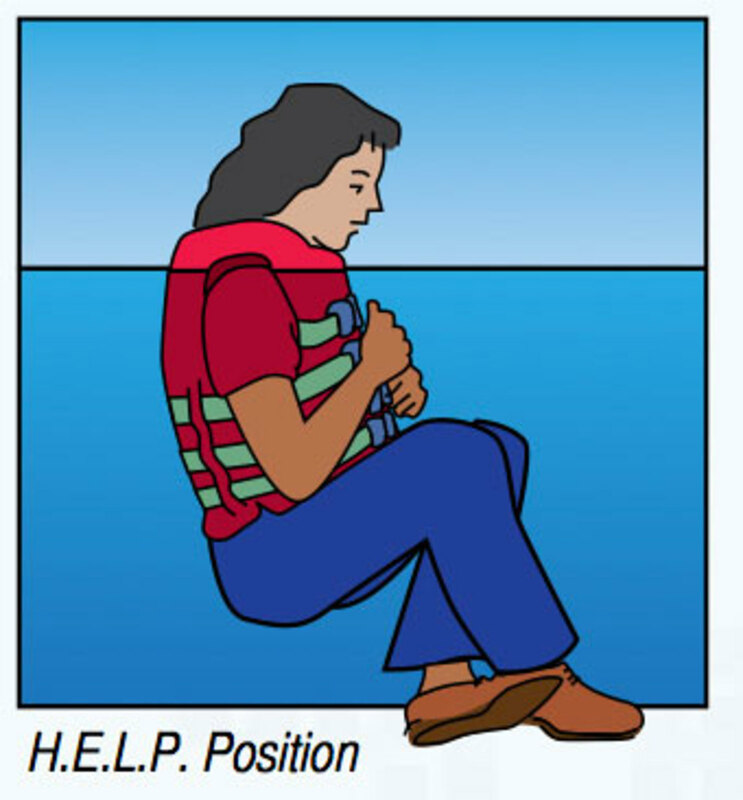 The dangers of falling overboard are amplified when the water temperature is below 60 degrees. 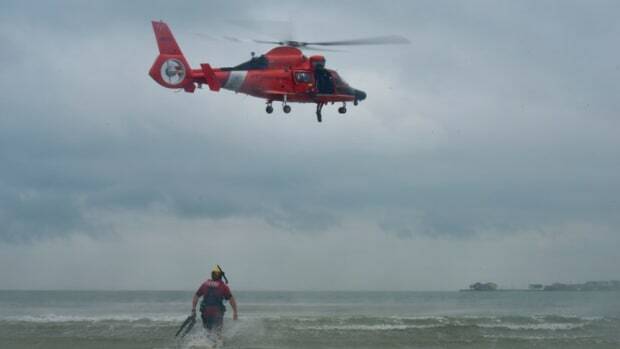 In this week’s Lifelines blog, retired Coast Guard rescue swimmer Mario Vittone talks about four things that can happen to the body in cold water — and dispels a myth or two. 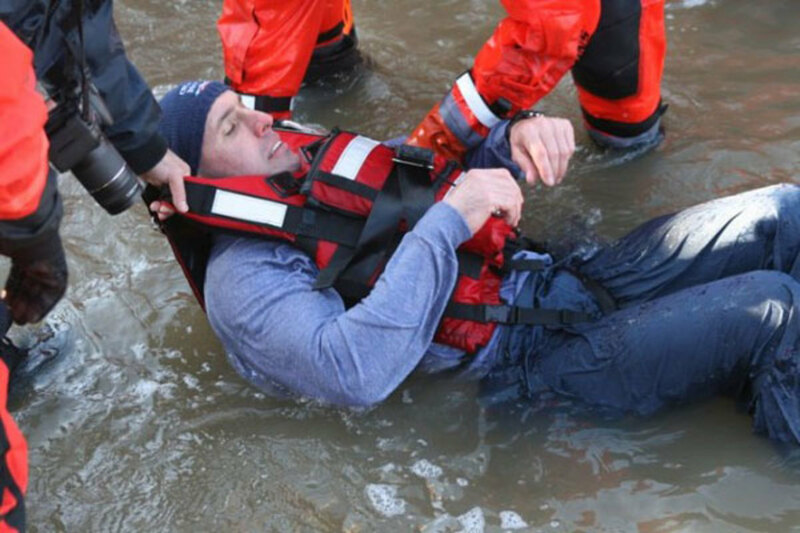 Mario Vittone takes a 41-degree dip in the Delaware River in this week’s Lifelines: Safety And Rescue At Sea blog. Watch his video to learn a simple cold-water immersion strategy that could save your life. 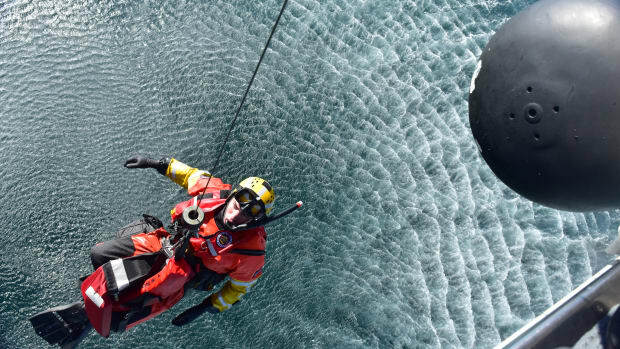 Most of what you know about hypothermia and cold-	water immersion is likely incorrect. Mario Vittone separates fact from fiction in his latest Lifelines column.